Earlier this month I went to cheer on some friends at the Hartford Half Marathon. I’ve never been on the cheering end before. In the past I’d either been running or hadn’t made it there. Last year when I ran the half, I went to watch some friends at the finish line after they finished a full marathon. Watching people cross the finish line was rewarding and emotional. You wish you could know everyone’s story. 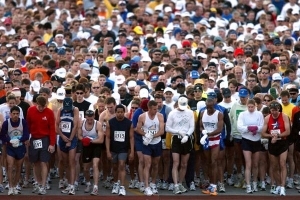 What inspired all these people to run 26.2 miles? This time I stood out on the street around mile 5.5 and cheered for runners—some are focused and intent with ear buds so they can’t even hear you; others reach out to give the kids lining the streets a high five. There was such a crowd I didn’t even get to see everyone I’d come to support. But cheering for people was fun. I was impressed and so happy with everyone who seemed to run by in a blink of an eye. I didn’t feel like running, but I did. It wasn’t one of my challenges. I saw it more as topping off a busy season of challenges. I signed up last minute. I knew I’d be glad after it was over. There is nothing you can do now. You’ve done all the preparing and you’ve eaten what you’re going to eat. Try to relax and take a few deep breaths before you take off. In Pilates we are always trying to control movement, but you simply can’t always control the body. You have given it all the preparation you can and you have to trust in that. How running feels today, how dinner reacts, and whether or not you need to make a pit stop is somewhat out of your hands. Run and have fun. Good luck Hartford Half and Full Marathoners. Have a great run! For information on Personal Euphoria & Evolution Pilates upcoming runner’s workshop click here. Today we are posting two videos for runners. The first is a how-to of five different exercises and the second is less than five minutes long and I do the same exercises without explaining them so that you can do them with me as a routine. These are five standing exercises, so they are great for right after a run. You can even keep your shoes on. Once you get the hang of it, you can do these exercises anywhere—while pumping gas, waiting for the microwave, or waiting in a line at the supermarket (and some of them are so subtle you may not even get any funny looks). The exercises challenge your balance while working your hip stabilizers, abs, and glutes. For info on our upcoming runner’s workshop click here. 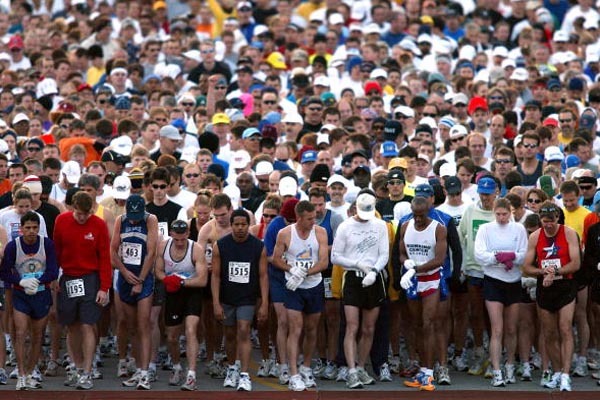 In honor of the Hartford Marathon this Saturday all our blogs this week will be about running. These five exercises are fabulous for runners—they stretch your quads and hams and work your glutes and abs. It’s like a runners dream all in five minutes or less. For information on our upcoming runner’s workshop click here.